The first question that comes to mind is if there is a real need of upgrading an existing solution which is tested and is working fine for a while. The second thought is if you want to take advantage of the latest and the greatest of SharePoint Framework, then this upgrade is necessary. It is an individual choice or a team decision to decide on the upgrade. However, to be in sync with the SPFx happenings, it is better to upgrade. The answer is "not always". Upgrading SPFx project is not always easy. You may often run into build errors. In this article, we will reuse CRUD Operations using No Framework implemented (from the previous article). Download the source code from the previous article to get started with upgrading the project. At the time of writing the previous article, SPFx version available was 1.5.1. Navigate to the SPFx project folder. Type the below command to open the project in the code editor. 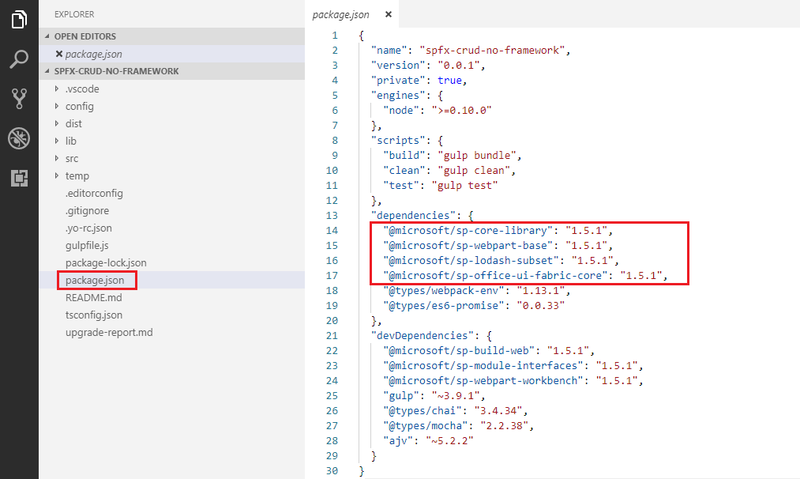 SharePoint Framework packages are denoted by prefix @microsoft/sp-. The version here is 1.5.1. The upgrade process will help us to upgrade our solution to the latest SPFx version (1.6 at the time of writing this article). Type the below command to get the list of outdated packages. The list has the below information. Current: Current version of a package used in the solution. Wanted: Version needed by the project (mentioned in package.json). Latest: the latest available version of the package. We need to upgrade each package reported as outdated. To upgrade the package to a specific version, use the below command. To upgrade the package to the latest version, use the below command. Or use the below command. In the command prompt, type below command to open it in the code editor. Verify that the packages are updated. Run the below command to update config.json to the latest version. Clean up the earlier packages by running the below command. Run the below command to build the project. Run the project with the below command. If this goes well, you have your project upgraded to the new version. If for some reason, the upgrade does not go well, follow the below steps. Install the latest version of Yeoman generator version. The Latest-Version-Solution has a reference of all the latest packages. 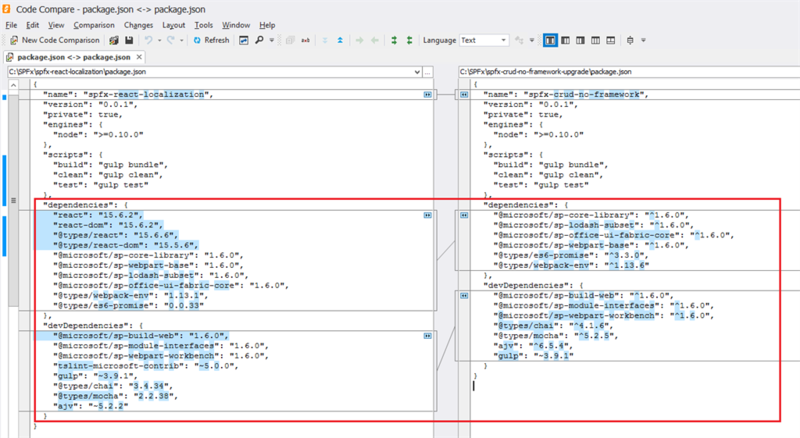 Compare and merge the package.json. I am using “Code Compare” from devart. 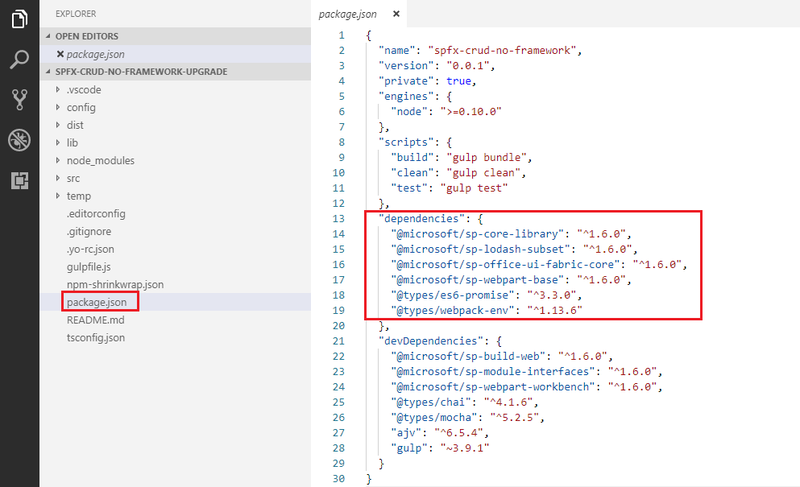 Below is the merged package.json. Also, compare and merge tsconfig.json file. Delete package-lock.json or npm-shrinkwrap.json from the solution. Run this command to download the updated npm packages. Delete previous build output by running the below command. Lock the package versions by running the below command. It is not mandatory but advisable to upgrade SPFx projects to get benefits of newer functionalities from latest versions. The upgrade process might not be easy, but can be carefully planned and executed.